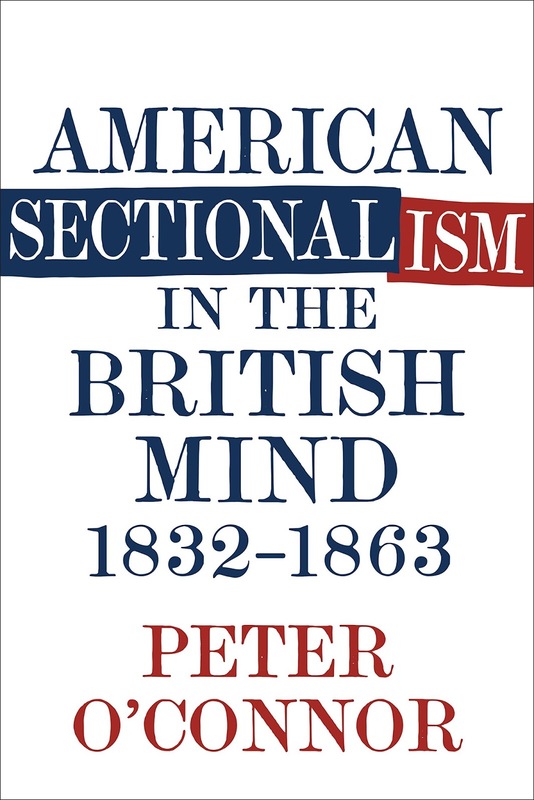 • American Sectionalism in the British Mind, 1832-1863 by Peter O'Connor (LSU Press, 2017). From the description: "In American Sectionalism in the British Mind, 1832–1863, Peter O’Connor [a lecturer in history and American studies at the University of Manchester and Northumbria University] uses an innovative interdisciplinary approach to provide a corrective to simplified interpretations of British attitudes towards the United States during the antebellum and early Civil War periods. Exploring the many complexities of transatlantic politics and culture, O’Connor examines developing British ideas about U.S. sectionalism, from the abolition of slavery in the British Empire and the Nullification Crisis in South Carolina to the Civil War." O'Connor's reading of British "travelogues, fictional accounts, newspaper reports, and personal papers" written during the decades preceding the American Civil War leads him to argue that the reading public in the U.K. was deeply interested in and well aware of "U.S. sectionalism and ... the complex identities of the North and South." When the war between the sections finally came, "the British populace approached the conflict through these preexisting notions." The volume's bibliography and notes seem to indicate a wide sampling of the types of writings referenced above as well as extensive synthesis of the printed literature. More from the description: "O’Connor reveals even antislavery commentators tended to criticize slavery in the abstract and to highlight elements of the system that they believed compared favorably to the condition of free blacks in the North. As a result, the British saw slavery in the U.S. in national as opposed to sectional terms, which collapsed the moral division between North and South. O’Connor argues that the British identified three regions within America―the British Cavalier South, the British Puritan New England, and the ethnically heterogeneous New York and Pennsylvania region―and demonstrates how the apparent lack of a national American culture prepared Britons for the idea of disunity within the U.S. He then goes on to highlight how British commentators engaged with American debates over political culture, political policy, and states’ rights. In doing so, he reveals the complexity of the British understanding of American sectionalism in the antebellum era and its consequences for British public opinion during the Civil War." In the end, O'Connor's book presents "a new explanation of how the British understood America in the antebellum and Civil War eras."